Baking bread with sourdough is the purest form of baking. Commercial yeast isn’t needed as naturally occurring yeasts are taking care of the rise. 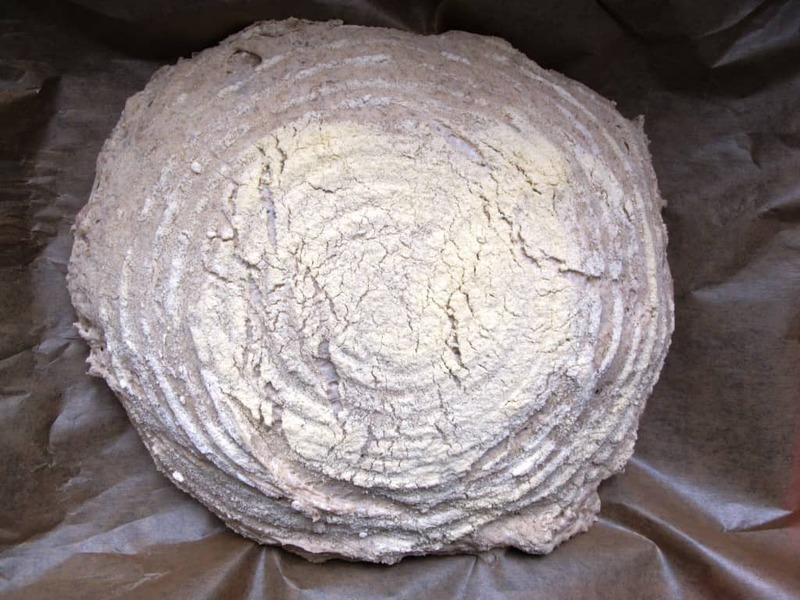 Keeping the sourdough in harmonious balance, baking with it again and again and transforming the most basic ingredients into wonderfully complex loaves is the essence of #realbread baking. Based on slow fermentation, the excellent flavour and texture of sourdough loaves are sure to reward your patience. If you are the beginning of your sourdough journey, start by creating a sourdough culture from scratch. All you’ll need is flour and water. 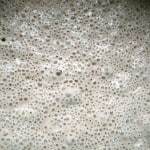 I’ve typed up step-by-step instructions for both a rye sourdough starter and spelt sourdough starter. If you like to read up all about the sourdough process in detail, Andrew Whitley’s book Do Sourdough: Slow Bread for Busy Lives has all the answers. We are celebrating here. With potato bread and champagne, great combination, try it! Potato bread makes use of potatoes to replace some of the wheat flour. The addition of potatoes keeps the bread moist and prevents it from crumbling. Usually, potato bread recipes use either raw or cooked potatoes. In this recipe, I’ve combined both methods and also included rye flour (my favourite). Mix ingredients in a bowl, cover with cling film and keep at room temperature overnight – approximately 16 hours. Mix ingredients in a bowl, cover with cling film and keep at room temperature for 2 hours, then transfer to the fridge for 14 hours. Combine all ingredients in a large bowl, mix together and knead for 12 minutes. It’ll be a little sticky, but the gluten strands make it easy enough to handle. Cover the dough with the bowl and leave to rest for 30 minutes. Fold the dough like an envelope – take each corner, fold it to the middle and shape the dough into a ball. Cover the dough again. Leave to rest for 30 minutes, then flatten and fold again. Leave to rest for another 30 minutes. Flatten and fold again, shape into a boule, then place (seam-side up) in a well floured proofing basket. Cover the proving basket with a polythene bag. Leave to rest for several hours, depending on the temperature in your kitchen. Alternatively, proof in the fridge overnight. Carefully turn out the dough onto the baking tray and place in the oven. Bake for 15 minutes then turn down the temperature to 180°C and bake for a further 40 minutes. Great with Kerrygold butter and honey but potato bread goes well with most toppings. Also great with this amazing Omelette Arnold Bennett! I usually use jumbo oats when making granola but they also make a loaf of bread nice and wholesome. Sourdough bread with rolled oats – check out that moist & chewy look! Rolled oats are oat groats (hulled whole grains) that have been rolled into flakes, steamed and lightly toasted. Note that the oats, although quite sizeable, will ‘disappear’ and completely blend into the finished loaf. Mix the ingredients in a bowl and cover with cling film for 16 – 24 hours. Toast the jumbo oats in a frying pan (no oil) for the nutty flavour to come out. Pour the boiling water over the oats and cover with cling film for 16 – 24 hours. Add all ingredients in a large bowl to form the dough, then knead for 10 minutes on a clean surface. Leave the dough to rest for 30 minutes; cover the dough ball with the bowl you used to mix the ingredients. After 30 minutes, fold the dough like an envelope. First squeeze out the air of the slightly risen dough and shape into a rectangular shape. Fold all four corners into the middle, squeeze together, then around to repeat the process another two times. Leave to rest for 30 minutes. Fold the dough into a round baton shape. Place into a very well floured proving basket and cover with a kitchen towel. If you don’t have a proving basket, you can just flour your kitchen towel and wrap the dough up tightly. After 1/2 hour preheat the oven to 250°C and line a baking tray with baking paper. Once the full hour is up (and the dough has doubled in size), carefully turn out the dough onto the baking tray. Make a few incisions at the top for a good-looking crust and place the tray in the lower half of your oven. Initially bake for 15 minutes at 250°C until the dough has browned well. Then reduce the temperature to 180°C and bake for a further 35 minutes. Make sure the bread is fully baked – it should sound hollow when you tap the base of the bread or in more scientific terms, the core temperature of the bread should have reached at least 93°C. 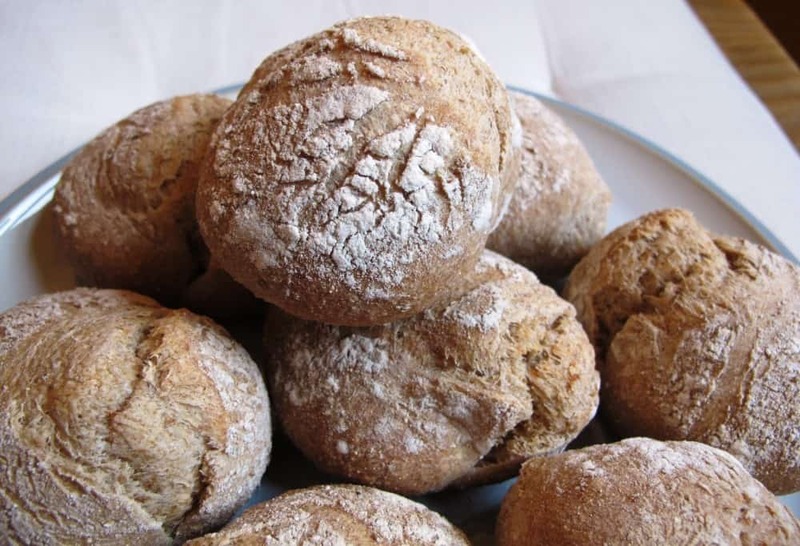 Schusterlaberl (also Schusterloaberl or Schusterlaibchen) which translates as ‘shoemaker loaves’ are fragrant Austrian rye bread rolls and have always been a favourite of mine. The smell of these freshly baked rye rolls is mesmerising and brings back childhood memories of stepping into the village bakery (now unfortunately closed) in Gilgenberg. Full of nostalgic feelings, I’ve been trying to bring the delicious Schusterlaberl back to life in my own kitchen in Edinburgh. 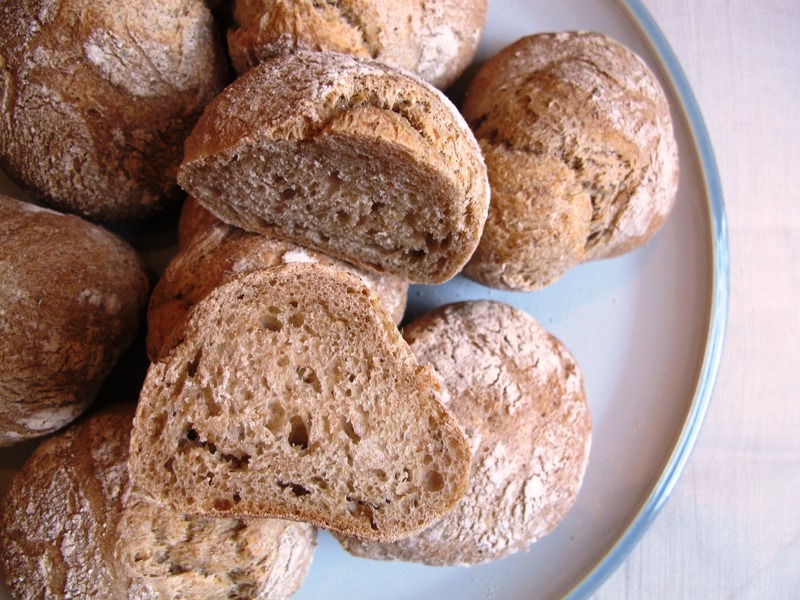 Here is my recipe for these unrivalled rye bread rolls. Admittedly, I still have to work on the roughness of the crust, but in terms of flavour and overall taste, I’m happy to say that I have succeeded to evoke the flavours of my childhood memories with the recipe below. 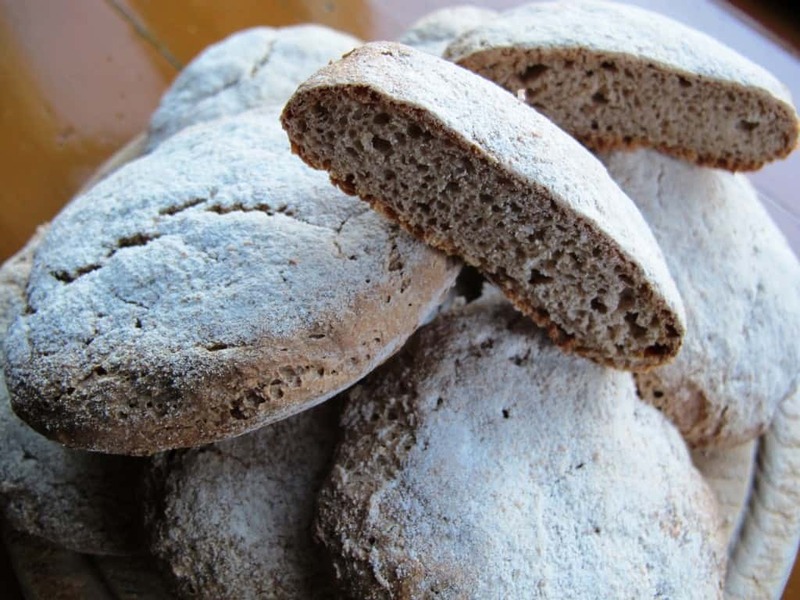 Schusterlaberl are made with both rye and wheat flour. 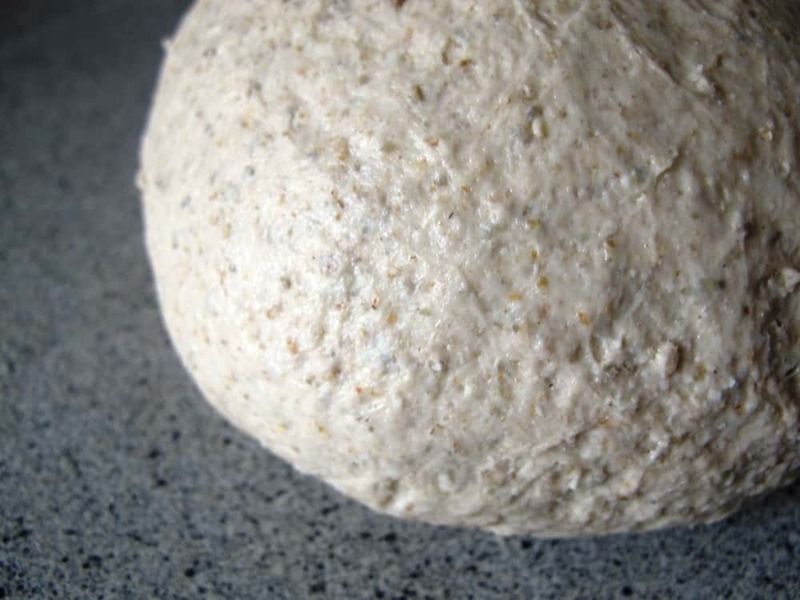 Natural sourdough and yeast are used as leavening aids and spices such as ground coriander seeds, caraway seeds, fennel seeds, and anise seeds give the rolls their wholesome flavour. 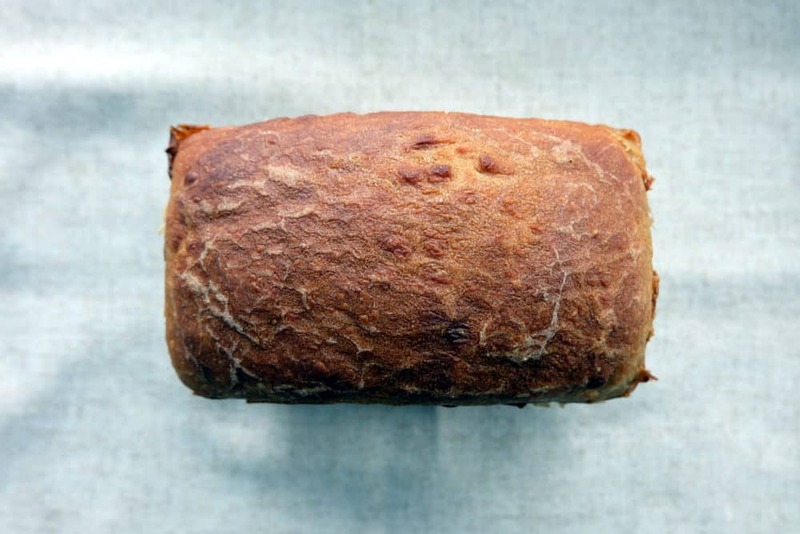 The rye rolls are characterised by their rustic look, crisp, their crunchy crust and chewy, dense centre. Combine the ingredients for your sourdough in a bowl, cover and leave to mature for approx. 16 hours at room temperature. Mix the sourdough prepared the previous day with the other dough ingredients and knead for 15 minutes. Shape into a ball and leave to rest for 2 hours (in a plastic bowl, covered) until doubled in size. You can also choose to slow-prove the dough in the fridge overnight. Prepare a clean kitchen towel and dust well with flour. Deflate the dough and turn it out onto a clean work surface. Shape into a sausage, divide into 12 pieces (approx. 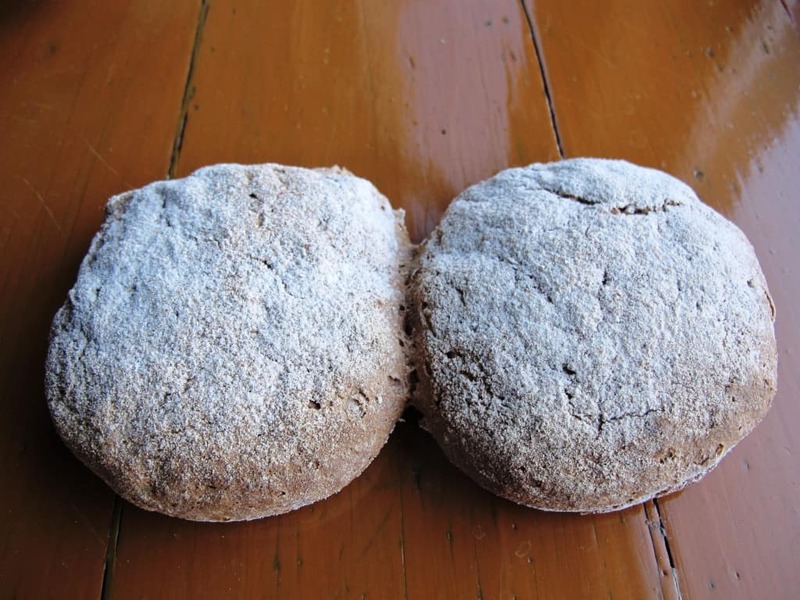 70 – 80g each) and form into a rough mini boule. Cover with cling film and rest for 20 minutes to relax the dough. 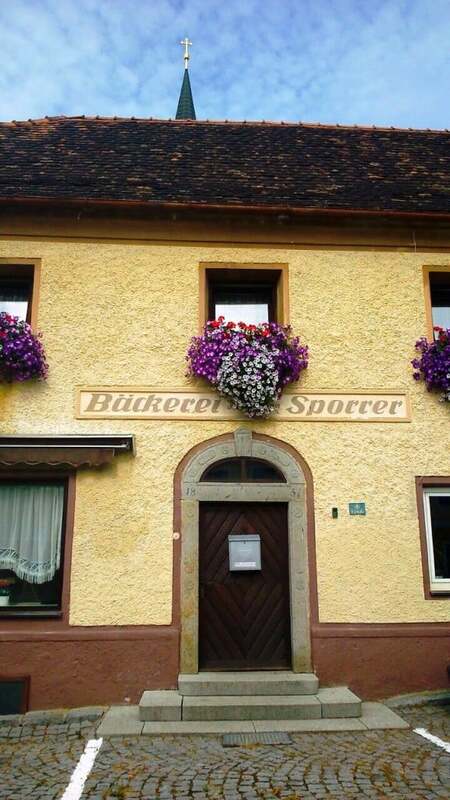 Now we get to the process called ‘schleifen’ in Austrian baker speak. Make a small indent to the bottom side of each piece, dip the bottom side in rye flour and shape in circular movements inside your cupped hand on a clean linen towel. Dip the bottom side in rye flour again and place each of the shaped rolls (rough bottom side down) on the kitchen towel and leave to prove. Cover again with cling film/plastic (to prevent them from drying out) and leave to prove for approximately 40 minutes. Depending on the temperature in your room, this could take longer. When still slightly underproved, place the dough rolls on a baking tray lined with baking paper (rough bottom side up this time). Leave enough space between the rolls – they should be at least 5 cm apart as they will rise some more and you don’t want them to touch. Leave to prove for another 20 minutes (or longer depending on the temperature in your room) to complete the proving process. While the rolls are rising, preheat the oven to 220°C. Place the baking tray in the oven on the middle rack. Bake the rolls for approx. 20 minutes until golden brown. Schusterloaberl are best the day they are baked but can be frozen for later (first cool completely, then wrap well). Defrost, then warm through at 180°C for 5 to 10 minutes. Rye flour is my favourite flour for bread baking. It produces breads with a rich and hearty taste, complex nutty flavours and a moist, dense and chewy texture. 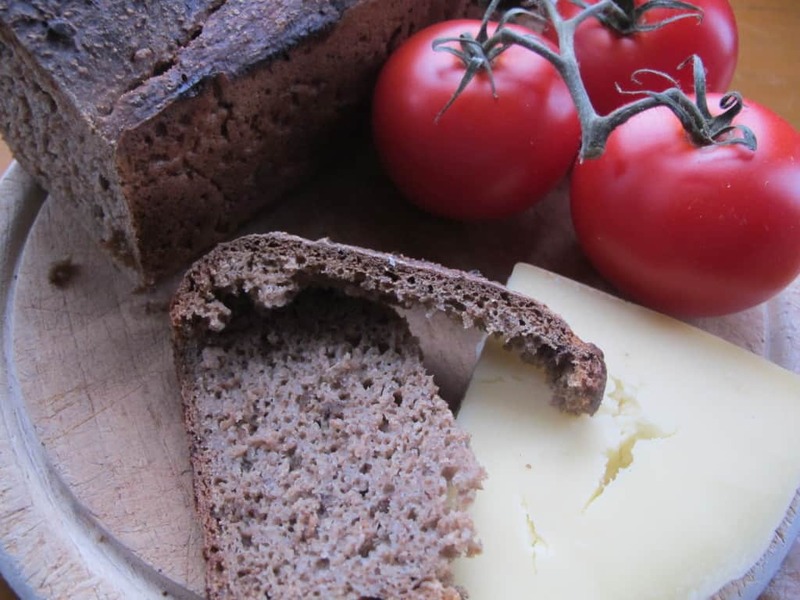 100% pure rye breads are higher in fibre and lower in fat than wheat loaves and therefore have added health benefits. From a practical viewpoint, I also love the longevity of rye loaves. 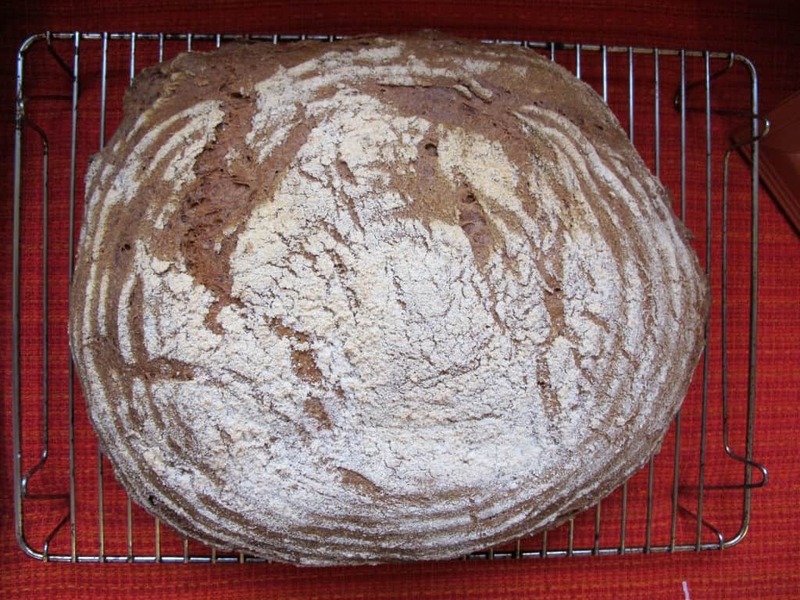 Here are my top four 100% rye bread recipes, all based on sourdough baking. There is one thing in all-rye bread baking I don’t enjoy – the sticky dough which is difficult to handle. However, the good thing is that rye gluten isn’t particularly strong and kneading is therefore not required. For purist reasons, I prefer not to add colouring agents such as molasses, malt, treacle, caramel, coffee or cocoa to achieve that rich, dark colour associated with rye breads. Having experimented with quite a few 100% rye bread recipes, my favourite loaves use sourdough, no commercial yeast. 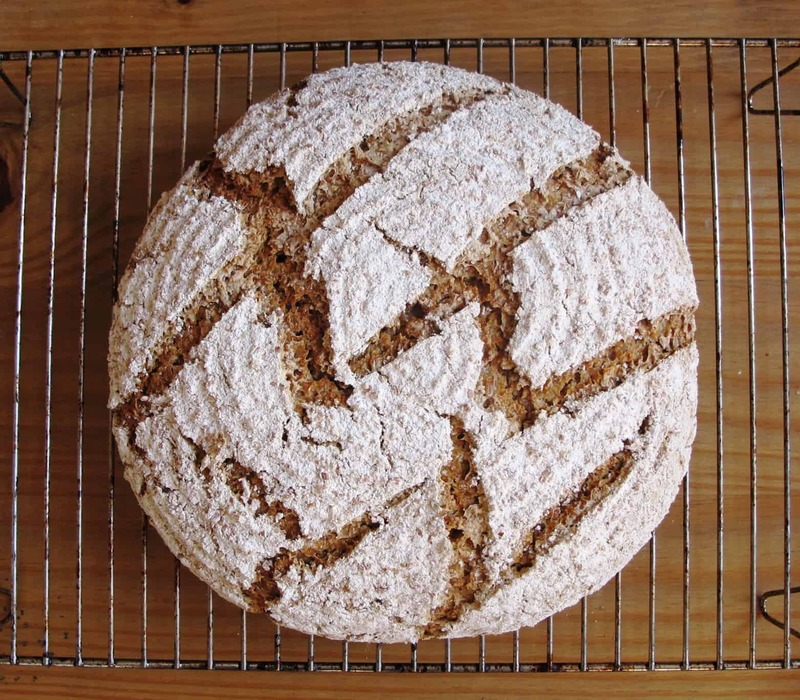 All recipes below are 100% rye sourdough loaves, without wheat flour. 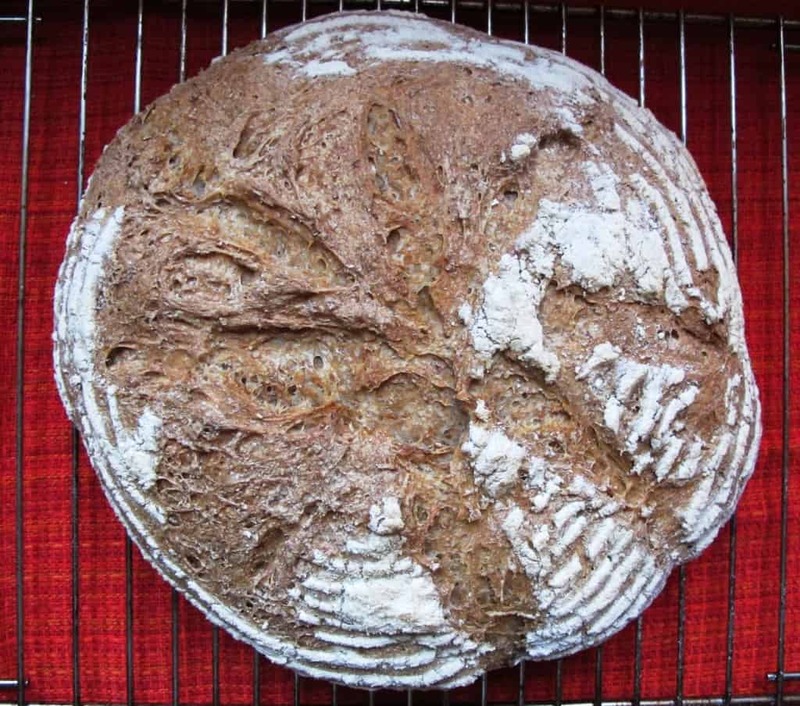 If you haven’t already got a rye sourdough starter, you can easily prepare one from scratch. I use rye flour in most of my bread recipes, it adds great depth of flavour and taste. 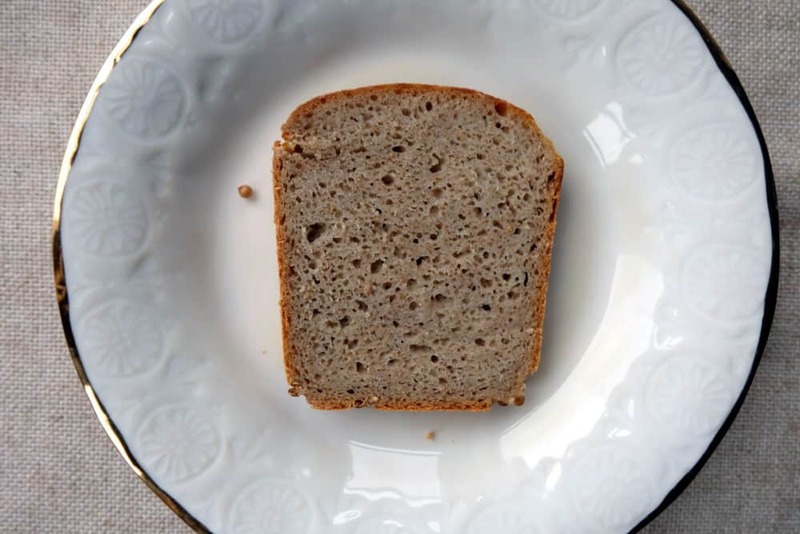 The following 100% rye bread recipes take this to the next level by using only rye flour. The recipe I love most requires only four ingredients: rye sourdough starter, rye flour, water and salt. I usually add a bit of Brotgewürz as an optional addition as it enhances the flavour of the loaf. 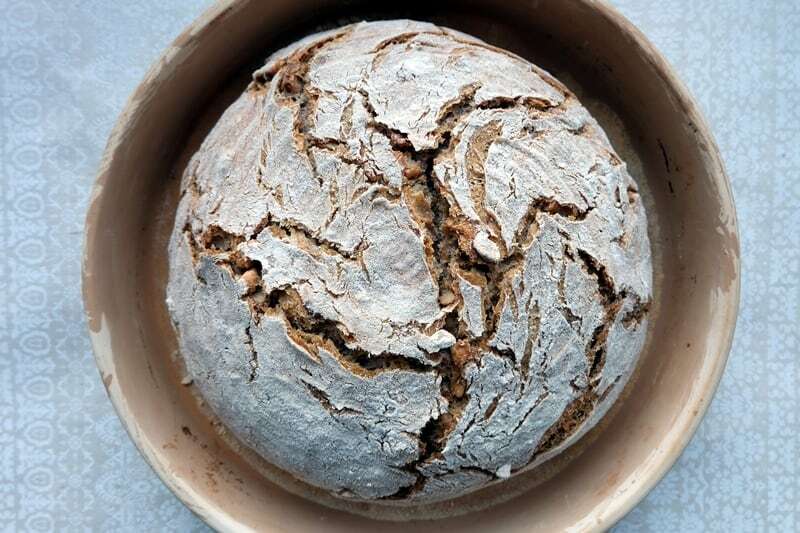 In a bowl, combine 50g rye sourdough starter, 220g wholemeal rye flour and 220g lukewarm water. Cover and keep at room temperature for approx. 16 – 24 hours. In a large bowl, combine 440g of yesterday’s sourdough mixture (keep the remaining sourdough for your next bake), 260g rye flour, 200g lukewarm water and 7g salt (plus 1 large tbsp of Brotgewürz if you like). Mix thoroughly, place the dough back into the bowl, cover and rest for approx. 30 minutes. Grease a lidded pullman loaf tin (I use vegetable oil and a kitchen brush to do this). Transfer the dough from the bowl to the tin. This is best done with wet hands and dough scraper. Distribute evenly. Sprinkle a little rye flour on top, then place the lid on the tin. Place the tin in the fridge overnight. Take the tin out of the fridge and preheat the oven to 240°C. The dough should have risen considerably – if the dough half-filled the tin on day 2, it should now be close to the top. Bake at 240°C for 10 minutes, then turn the heat down to 220°C and bake for another 45 minutes or so. If in any doubt, give it a little longer in the oven – rye loaves hold a lot of water. Once completely cooled, wrap in cling film and leave to rest for a day. The flavour of the loaf will develop further in that time and the crumb will improve. by Dan Lepard. I ususally add caraway seeds or coriander seeds for extra flavour. Here are the recipe and my baking notes. Prepare a medium bowl and weigh in 60g fine white rye flour. Boil 240g water and cool it to 90°C (I use a Thermapen to check this). Add the water to the bowl and whisk it in. Try to avoid too many lumps by whisking quickly and vigorously. Cover the bowl and leave for 16 – 24 hours (same as the sourdough below). 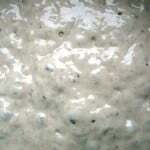 In another bowl, combine 50g rye sourdough starter with 100g dark rye flour and 100g water. Mix well, then cover and set aside at room temperature for 16 – 24 hours. In a large bowl, combine 50g cold water with 200g rye sourdough (the rest goes back into the fridge for your next bake). Whisk together. Add all but 2 tbsp of the gelatinised rye mix into the bowl and whisk in. Add 300g fine white rye flour, 7g salt and a tbsp of rapeseed oil and mix well. I use a silicone spatula to do this and avoid getting stuck in with my hands – it’s a soft sticky dough. 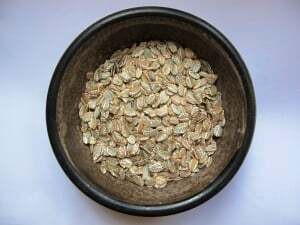 Prepare a loaf tin (the one I use is 15.2 x 10.2 x 12.7 cm), spread a tbsp of caraway or coriander seeds at the bottom, then – with wet hands – take the dough and put it into the tin. Even out the top and spread the gelatinised rye mix over the top. Cover with a polythene bag and put into the fridge for 16 – 24 hours. Take out the loaf tin from the fridge, the dough will have almost doubled in size. Once cold, wrap in kitchen baking parchment, tie well with string and leave for a day before slicing. The bread tastes great with smoked fish, smoked meats with horseradish or root vegetable soups. 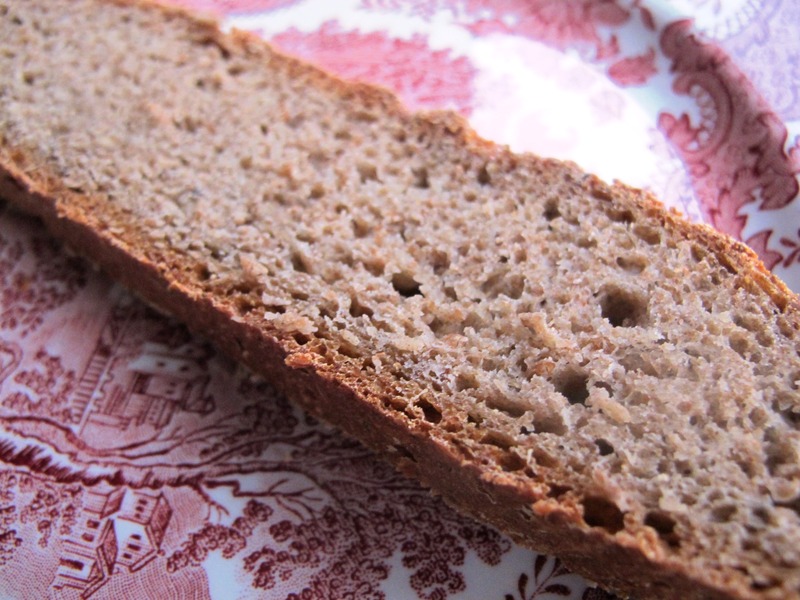 I bake this 100% rye bread recipe almost every week. It uses an old bread soaker which is popular in German sourdough bread baking. Combine ingredients in a bowl, cover and keep at room temperature for 16 – 24 hours. Combine ingredients in a bowl, cover and keep at room temperature for 3 hours. Soak old bread in a small bowl for 3 hours, then puree with a stick blender. This is a technique commonly used in German-style bread baking and adds great flavour. Place the dough in a bowl, cover and keep at room temperature for approx. 30 minutes. Butter a large heavy-duty loaf tin (I used a Pullman loaf tin, 33 cm long, 10 cm wide) and sprinkle some crushed fennel or coriander seeds onto the bottom of the pan (these will infuse the bread during baking). Move the dough from the bowl into the loaf tin and distribute it evenly (best done with wet hands). Cover the loaf tin with a lid if you are using the Pullman loaf tin. If you don’t have a lid for the loaf tin, place the tin into a polythene plastic bag. Covering it is important to prevent the dough from drying out during the final proof. Place the covered loaf tin in the fridge overnight – approximately 10 to 12 hours. Take the loaf tin out of the fridge. The dough should have visibly risen. Once the oven is preheated, bake for 65 minutes. If you are using a Pullman loaf tin, leave the lid on during the bake. If you are not using a Pullman loaf tin, you can bake the bread without a lid. Leaving the lid on will keep the bread moister but you will be able to achieve great results without the lid as well. If using a lidded loaf tin, take the lid off for the last 10 minutes of the baking time, to help brown the top crust. Finally, taking pure 100% rye bread recipes and baking one step further, try my traditional German pumpernickel recipe, using rye grains and cracked rye instead of flour. Vinschgerl (also sometimes Vintschgerl) are rustic palm-sized flatbreads which originate in South Tyrol. Blue fenugreek (Brotklee, Schabziger Klee, trigonella caerulea) adds a very distinctive, slightly spicy flavour to these delicious breads and the flat shape ensures that there is a lot of surface for the strong crust to form. 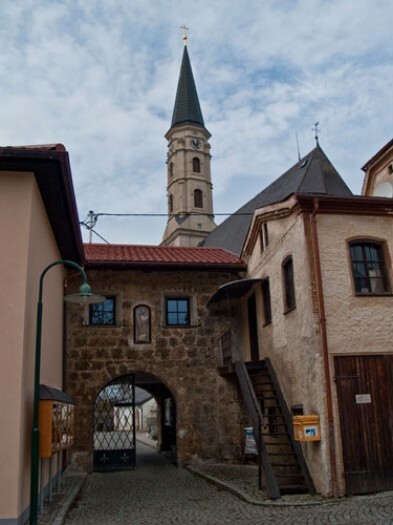 Vinschgerl – Rustic, aromatic flatbreads. Great to serve with a charcuterie board! Mix the wet ingredients (water, honey, yoghurt) in a small bowl. In a large bowl mix the flours, sourdough extract, yeast, salt, blue fenugreek and the crushed seeds together. Add the wet ingredients to form the dough (using your hands for this will be easiest). The dough should be quite soft and gooey due to the high rye content. Add some more water if necessary but don’t add any more flour. Leave to rise in a warm place for up to 6 hours. The dough will have a less sticky, ‘cleaner’ consistency after this long rest and you will be able to shape it into a rectangle (approx. 2 cm high) on a clean work surface. If it’s still too soft, just shape it into a rectangle with wettish hands. Take a knife to divide the dough into 12 smaller rectangular pieces. Put the pieces onto two separate pieces of baking parchment (6 each). Place two pieces each right next to each other – this is the traditional way of baking them. Leave to rise in a warm place for another 1 – 2 hours. ½ hour before baking – preheat the oven to 220°C (Gas 6). A pair of Vinschgerl, baked in the traditional way. 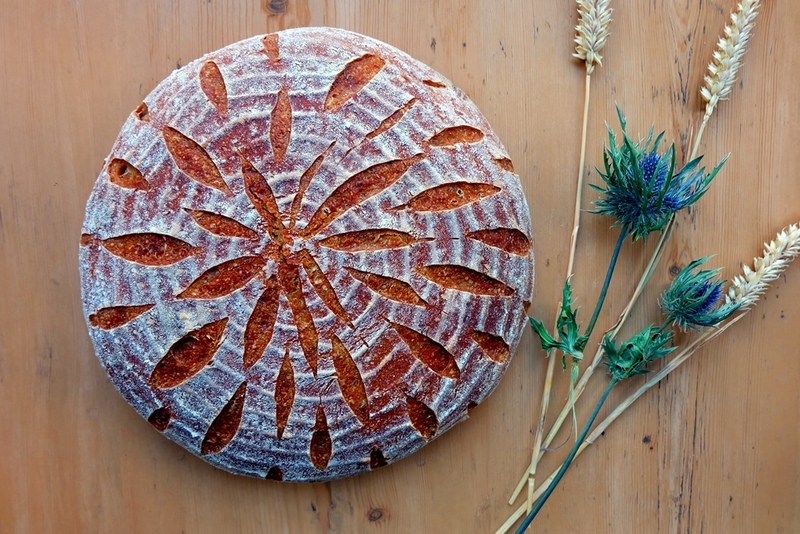 Also try this rye flatbread recipe for South Tyrolean Schüttelbrot. Having been home in Austria for Christmas, I brought back a big pack of shelled walnuts from the trees in my parents’ garden. A good time to experiment with walnut bread! 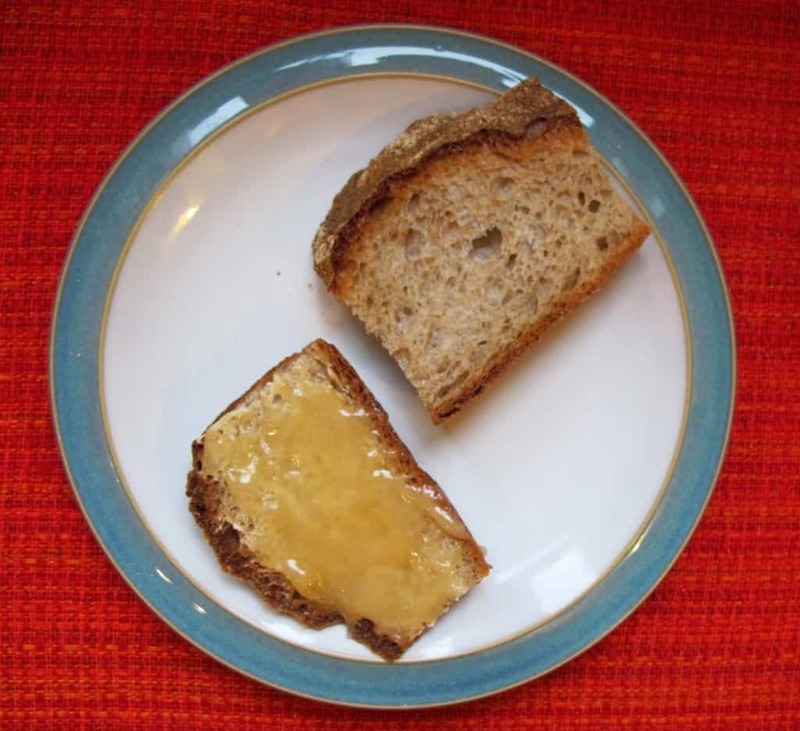 Try my walnut bread recipe below – a sourdough walnut loaf using white wheat and wholegrain rye flour. My walnut bread is a slightly sweet bread and as such makes a great accompaniment to cheese boards with grapes, apricots or figs. 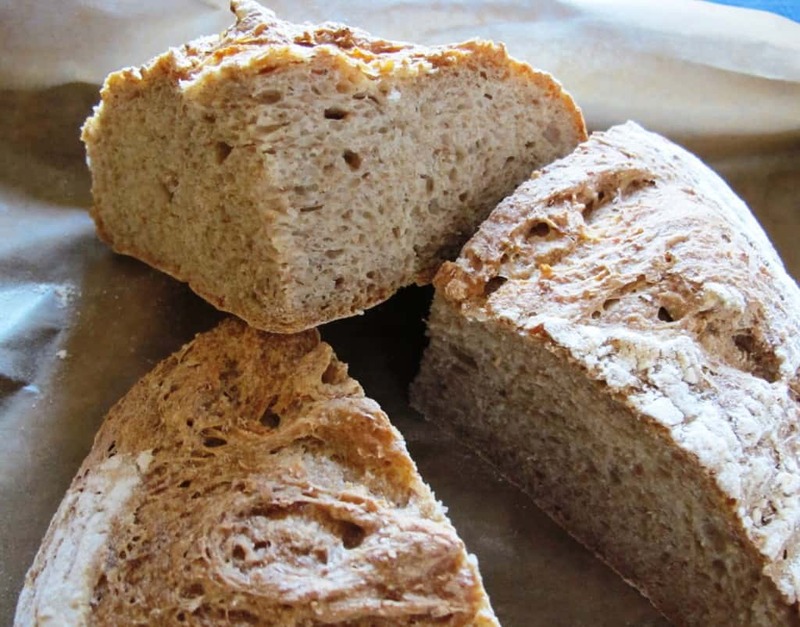 Walnuts are super versatile and can be incorporated into bread in various different ways. 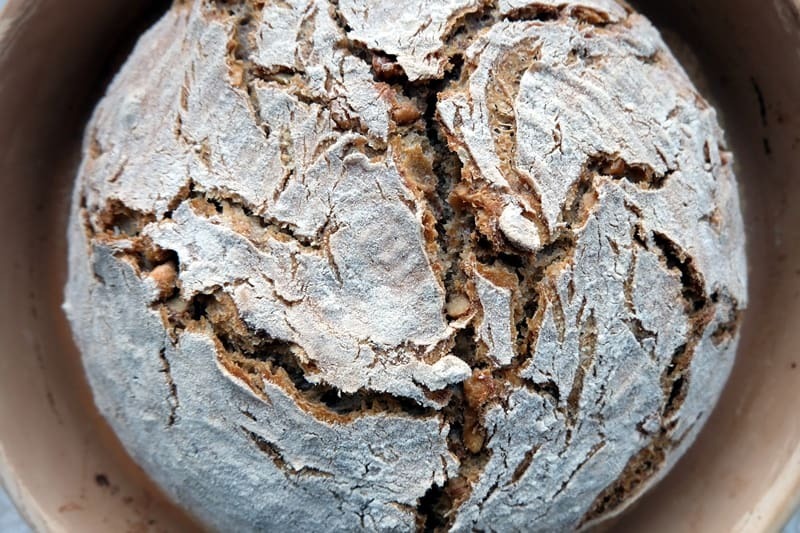 Although the main walnut bread recipe remains the same, have a look through the walnut preparation options below to pick your favourite before starting. 200g walnuts in either of the below variations (e.g. 100g lightly crushed walnuts, 100g walnut paste or 200g caramelised walnuts). Lightly crushing your walnut halves with a rolling pin makes it easier for the oils to be released into the dough. Finely chop fresh rosemary leaves, you need 1 tbsp. Dry-roast 200g walnuts in a frying pan (i.e. without any oil). Add the finely chopped rosemary and 2 tbsp of honey and caramelise the walnuts. Be careful not to burn them. Let them cool on a plate. For this recipe, you need 100g of walnut halves, lightly crushed, as well as 100g hazelnuts. Dry-roast the hazelnuts in a frying pan (no oil). Pour over 35ml of lukewarm water once finished roasting. In a separate pan, dry-roast the walnuts and cover with 3 tbsp of rum. Leave to soak overnight and drain any excess liquid. Heat some milk until boiling – you’ll need enough to cover 200g walnuts in a small bowl. Cover the walnuts with boiling milk and leave to cool. Once cooled, drain any excess liquid. As per Dan Lepard’s book ‘The Handmade Loaf’. Make 100g walnut paste and also add 100g of halved or crushed walnuts into your final dough. For the paste, you need 50g of walnuts, 50g of water, 2 tbsp of honey, 20g melted butter (lightly browned) and a pinch of salt. 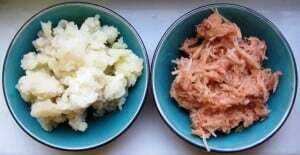 Place all ingredients into the bowl of your hand blender and blend until you have a soft, smooth paste. Combine the sourdough ingredients in a medium bowl, cover and leave to rest at room temperature for 16 to 24 hours. Combine 200g of sourdough (the rest goes back into the fridge for your next bake) with the main dough ingredients and walnut paste if using, but don’t add the whole walnuts at this point. Knead the dough for about 10 minutes. Shape into a ball, place in a lightly floured bowl, cover and keep at room temperature for an hour or so. The dough should have visibly expanded during this time. Use your fingers to flatten the dough and sprinkle the (lightly crushed, caramelised or soaked) walnuts over the surface. Work the dough to distribute the nuts evenly. Shape the dough into a round and place into a pre-floured proofing basket. Leave to rise for several hours at room temperature until fully proofed. Preheat the oven to 200°C and preheat your La Cloche baking dome at the same time (from cold) if using. Transfer the bread from proofing basket to the La Cloche plate or onto a baking tray lined with baking paper. With a sharp knife, make a few criss-cross cuts into the loaves just before baking. Bake for about 50 minutes. Take the La Cloche lid off for the last 10 minutes if using.